Many of us don't want to drink anything before going to bed to avoid getting up during the night,,,but what we don't know is that just 1 glass of water before going to bed, helps prevent Strokes & heart attacks. 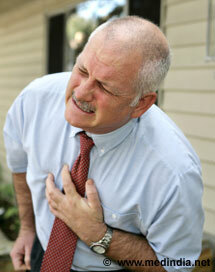 If alone at home during heart attack>>one can help themselves by coughing repeatedly and very vigorously. A deep breath should be taken before each cough, and the cough must be deep and prolonged, as when producing sputum from deep inside the chest. Keep your heart clean and drug-free Heart Disease: Unhealthy lifestyle & foods, hereditary factors and lack of knowledge can promote heart diseases in millions of people. Commonly, people suffer from high blood pressure. Some suffer heart disease due to diabetes. Others develop an arrhythmia, murmur, or irregular heartbeat. Increasingly, women are becoming more prone to heart diseases especially after menopause. 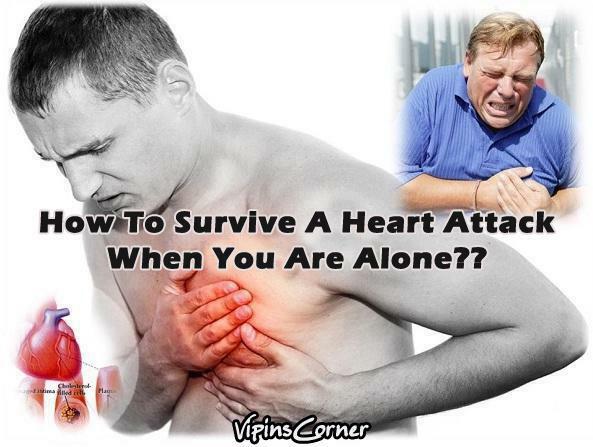 SERIOUS TIPS about HEART ATTACKS!!! 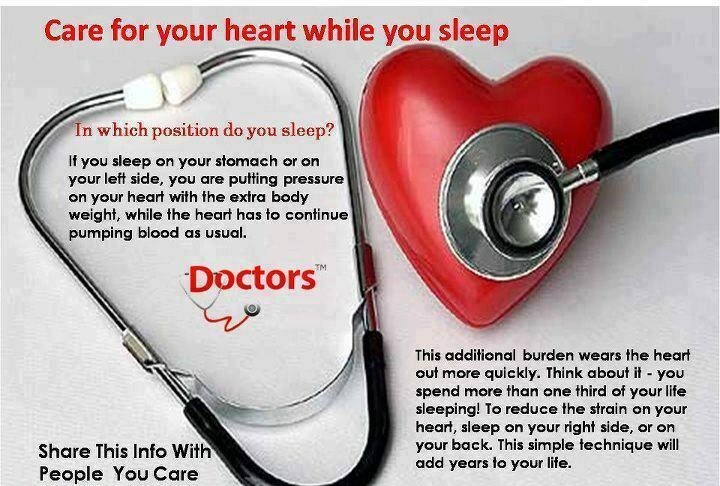 Do's & Don'ts while you sleep!!! A heart attack is the heart's way of letting you know that something is seriously wrong. Technically, a heart attack occurs when the supply of nutrient-rich blood to the heart muscle is reduced or stopped. If the blood supply is shut down for a long time, muscle cells die from a lack of oxygen. If enough cells die, the victim will also die. Often, only a small part of the heart muscle is deprived of oxygen so the victim can recover. Most common reason for reduced blood supply is arteriosclerosis, involving thickening of artery walls causing choking of arteries. If blood is unable to flow through the blood vessels, it cannot nourish the body and heart. Aerobic activities really "get the blood pumping." As the heart beats faster, the blood circulates more quickly, delivering extra oxygen to the muscles. This builds strength, or cardiovascular fitness. Some good aerobic activities are walking, hiking, jogging, bicycling, swimming, jumping rope, and roller skating. Some forms of exercise, like weightlifting, can build muscle strength without building cardiovascular fitness. Feeling of discomfort or heaviness in the chest..could also be more of a burning sensation. Any of these symptoms should not be taken lightly, and if it occurs more than once, you need to rush to your doctor. If another person is complaining of the problem, chances are they have experienced the feeling before and are only expressing it now. So, rush them to the nearest doctor or hospital immediately for a check up. If your breathing gets heavy and the breath falls short even after a short walk, climb or other form of movement or exercise, it should be a huge cause of worry. Even if this condition is not accompanied with chest discomfort, it should be taken as a warning sign. Excessive sweating even in cool conditions is uncalled for. If you notice such sweating, consult a medical professional immediately. 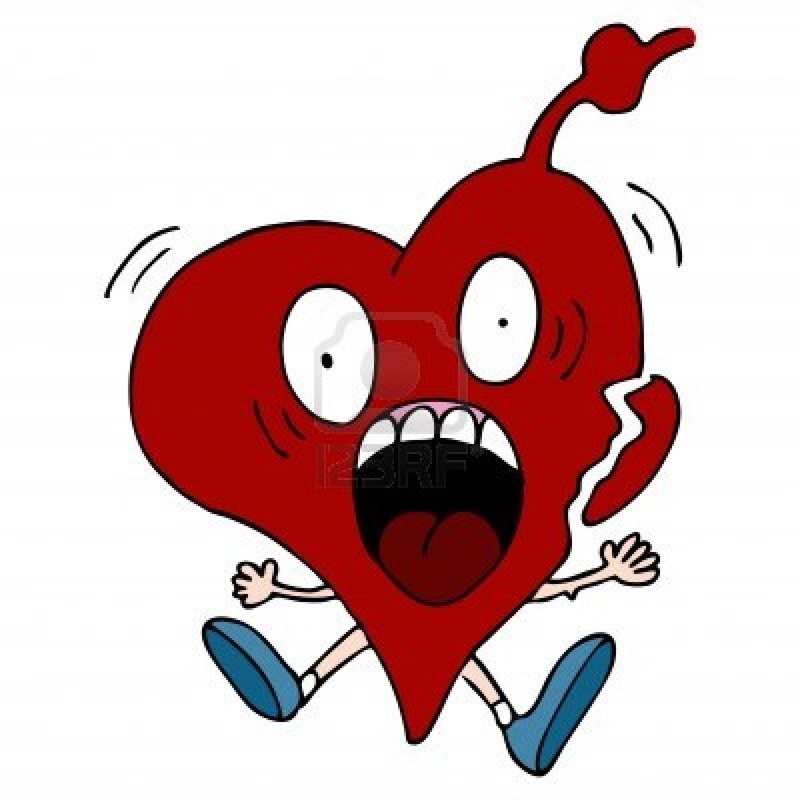 Regularly feeling nauseous of dizzy could imply the onset of a heart attack. Do not treat is callously as a sign of tiredness. This could happen due to the artery getting blocked. It could also display itself via excessive stress, fatigue after short spans of movement or exercise, or a feeling of weakness despite eating and sleeping well. 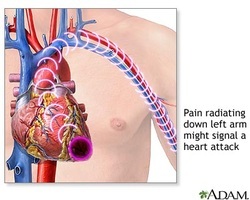 If your arms feel numb and seem to be drifting to the sides, heart problem may be the cause. If certain parts of your body begin to stop responding, do not ignore the circumstance. The affected parts may be the shoulders, arms or back of the neck. Difficulty while speaking need not necessarily occur after a bout of drinking with the buddies. It could be a graver situation than that! Inability to speak coherently could be the sign of a great attack. If you think you are suffering this ask a friend or relative to help by asking them to understand what you are saying. Buy 1 Get 1 Free When You Buy the Advanced Cardio Solution for healthy cholesterol levels + free shipping on US orders of $99 or more at HealthResources.net! Sale valid for 4 days only 2.15 to 2.18. Heart is the pumping station of the body and needs to be taken care of all the time....RECOGNIZE symptoms to prevent heart attack, do heart exercises, follow the correct way of sleeping and eat healthy foods to help keep heart strong. Read here for some ways to protect heart & share your tips.